Cheap flights to Australia: Perth, Melbourne and Sydney from €596! UPDATE 12.2.2019: Cheap flights to Australia available from Prague to Melbourne for only €596 / 15418 CZK! Travel dates from March to May 2019, 2x 23 kg luggage included. Fly e.g. 7.-22.3., 10.-25.3., 14.3.-1.4., 24.3.-12.4., 4.-12.4., 14.4.-5.5., 14.4.-12.5., 6.-24.5. BOOK NOW, check screenshot. 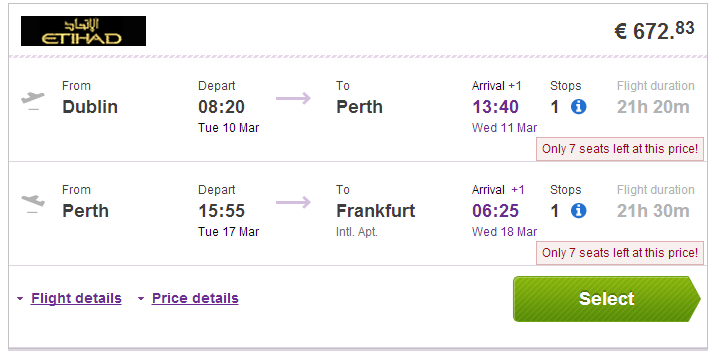 Multicity tickets Dublin – Perth – Frankfurt are available for only €672! You can also fly on route Dublin-Melbourne-Frankfurt for €672 or Dublin-Sydney-Frankfurt for €680. Return is also possible to Berlin for €32 more or to Dublin for €57 more. Regular price on flights from Europe to Australia is €1000+. Travel dates are from February until June 2015. Book on BudgetAir (click on Show extra search options to enter return to Frankfurt). « MEGA HIT! Error fare fligts to Mexico City from Spain for only €189! !